I took this photo after a bit of a clean-up. So, as you can see, I am a bit disorganized at times. But this month, the pantry is getting a total clean-out! I had two main goals, when tackling the clean-out and organization of my pantry. One was to make sure nothing was going uneaten. And the other, to make room for the pantry staples which go on sale every fall. Around here, that would be baking supplies and canned goods. I would hate to pass up on a great sale, simply because I didn't know where I'd store it all. So, for the last two weeks I've been cleaning out the pantry, one shelf at a time. To get myself started, I chose the tidiest, least cluttered shelf. For one thing, this was the least intimidating. And another, if it was already not too cluttered, then it would make room for new items as I cleaned other shelves. I didn't require myself to do a bang-up, cleaning whirlwind all in one day. But instead just set out to do one shelf per day, usually while I was preparing dinner, or waiting for some baking. As you can see, I have a lot of large plastic storage containers. Part of my mess was that many of these containers were empty. (Oops!) 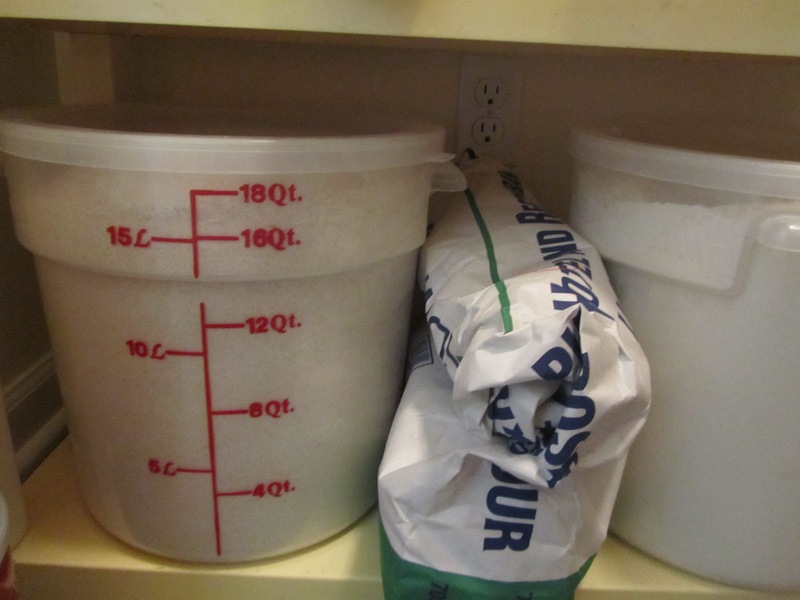 So I had bags of dry ingredients and empty containers doubling the use of my available space. 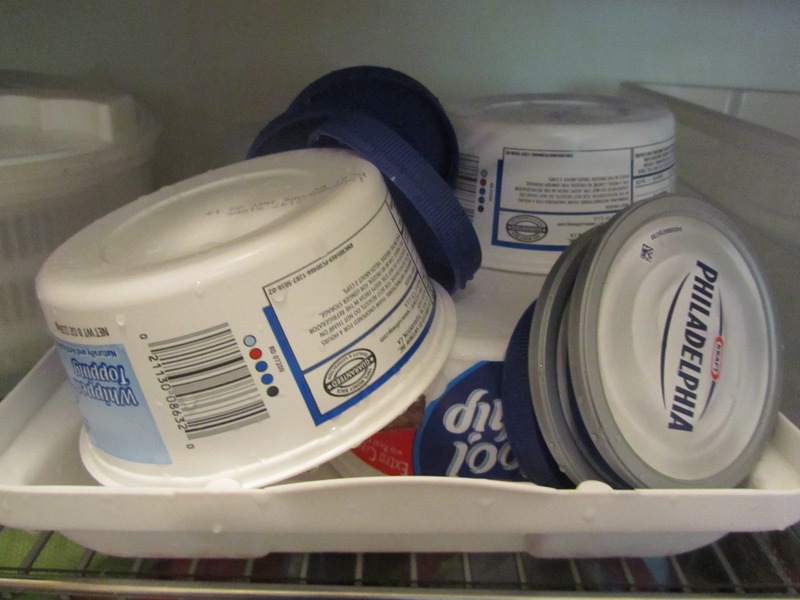 First things first, I filled all the containers. This got the large sacks off the floor. Next item of priority, I removed everything that didn't need to be stored in the pantry, and found other storage for these items. For instance, I had cleaning supplies in the pantry. 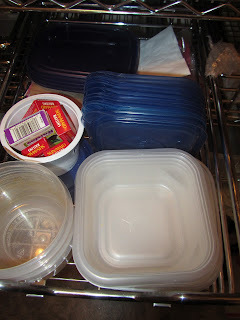 By moving these out to the cleaning cabinet in the laundry room and under the kitchen sink, I freed up some space. Also, I was keeping some table linens in the pantry, while other linens in a closet next to the dining room. (Why I didn't have them all together in the first place is a mystery to me.) I consolidated all of it in the closet next to the dining room. As much as possible, I tried to make dedicated spots for everything, keeping like items together. For example all the big jugs of liquids are stored together on one shelf. The two large flour bins are side by side, and the remaining flour in one of the bags is right next to the bins. I wiped down shelves as I went, but did not concern myself with the stained plastic on the shelving unit. That would just be a huge time drain to try to remove all stains. I tried to work quickly as much as possible. I'd say each shelf took me about 15-25 minutes. If I had a shelf that I found particularly intimidating, I skipped it for the time being. My mind just hadn't fully processed how I'd organize that space in that moment. As I found tiny amounts of stuff, like 1 marshmallow in a bag, and one cracker in a box, I bagged these up for brown bag lunches the next day, or plated them up and had myself a nice little treat. No need to hang on to that one and lonely. I thoroughly cleaned out corners. they're big "hiding spots". I did find an entire loaf of homemade whole wheat bread, lodged between one of the shelving units and the wall. It was quite moldy; I'd say about 3-4 weeks old. It had gone unnoticed because I had a bunch of bags down that wall. There's about 3 inches of space beneath one of the units. 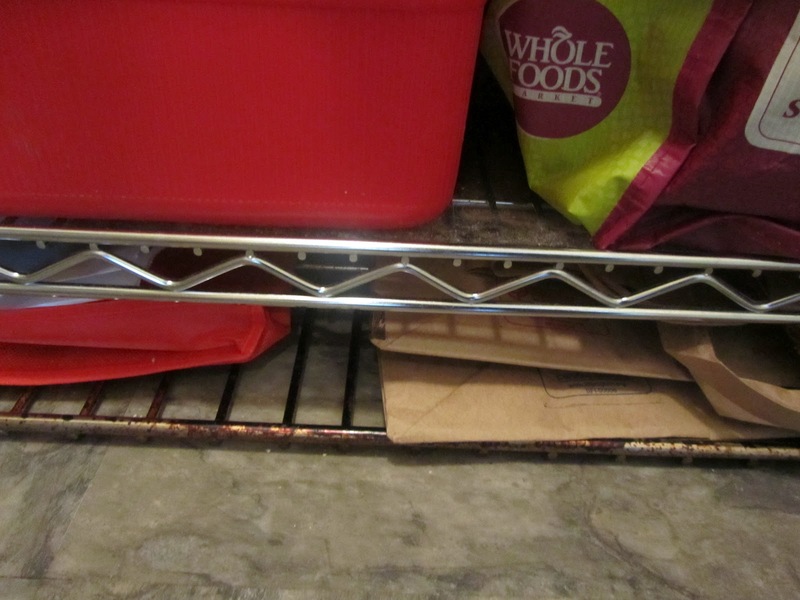 I used that space to store my extra oven rack and flattened paper and reusable shopping bags. 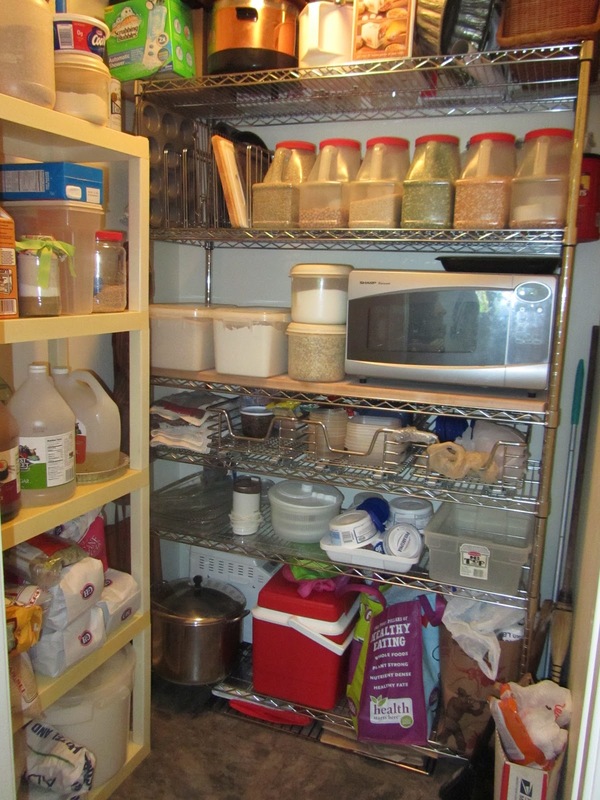 Food, cooking equipment and plastic containers had been all jumbled before, mixed between the two sets of shelves. I decided to keep one set of shelves for food only. This will make finding food items easier in the future. I sorted all my plastic storage containers, got rid of many that do not stack neatly. 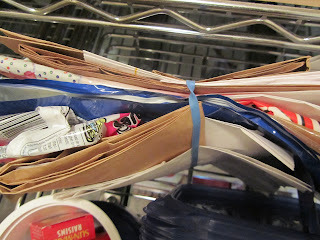 I also found new storage for reused baggies outside of the pantry. I'm hoping to slow down my family's use of these bags, as they are so much harder to clean than rigid plastic containers. 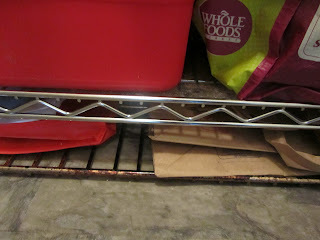 As my home cooking repertoire is always changing, I needed to refine and retool my storage. I'm doing yogurt regularly now, so I need a convenient space for a large kettle and picnic cooler. 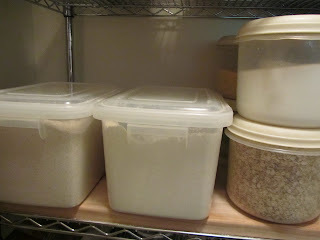 I no longer use the bread maker (gasket wore out), so instead of keeping on counter, it needs storage in the pantry. I have a great set of repurposed plastic food storage containers, like these ones with handles. They can go on slightly higher shelves than a plain plastic bin. With the handle I can get it down easily. This is my brown bag lunch container drawer. 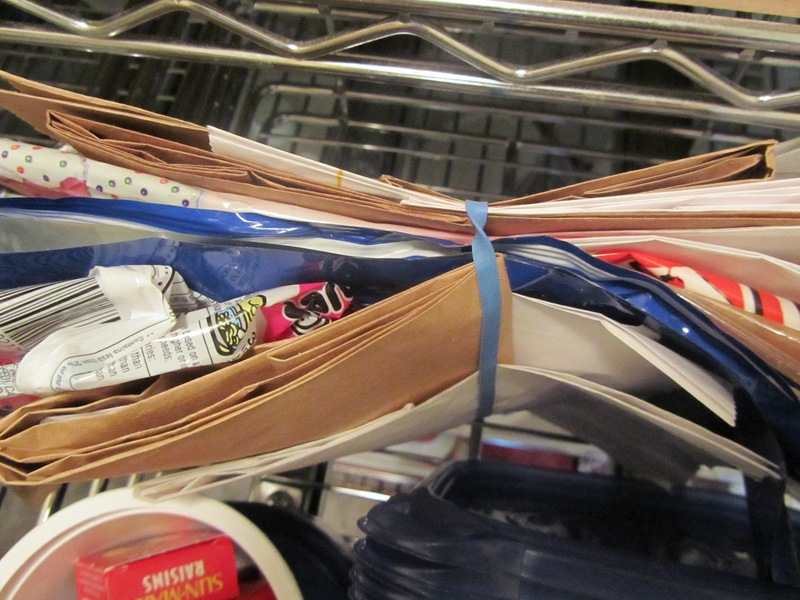 I keep the sandwich and soup containers in here, along with empty raisin boxes (I refill for the kids). Also in this drawer I keep the empty plastic bags that food comes in, like Ramen packages, cookie bags, chocolate chip bags. 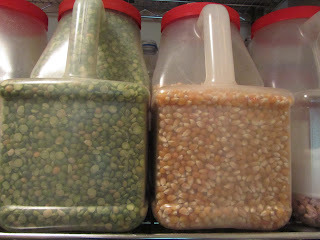 I reuse these for sandwiches, popcorn and muffins. They get one more use before tossing. I also have in this bundle, empty bakery and fast food bags. These can be used for dry items like popcorn or as lunch sacks themselves. I use a large plastic storage bin as a drawer on one of the shelves. It's empty right now, but will hold canned goods and baking items in a couple of months. 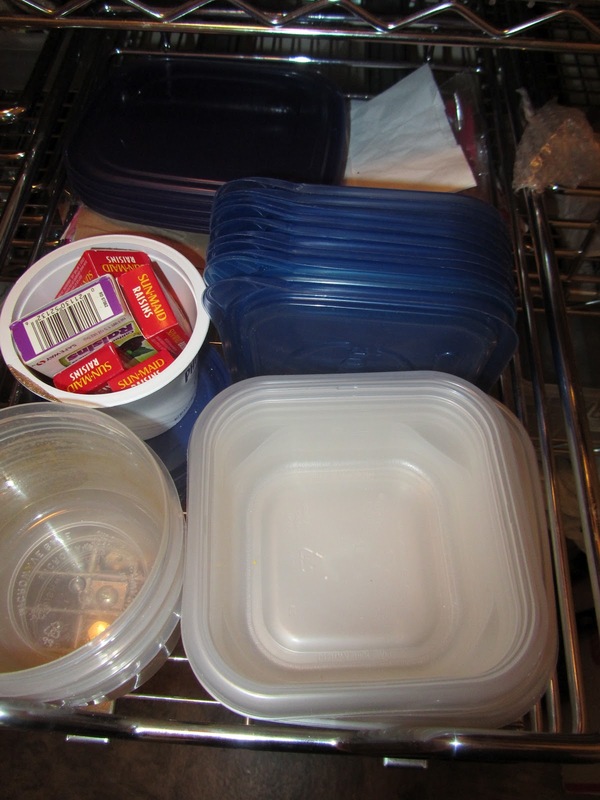 The lid from that bin is our plastic container drying rack. I wash plastics in the dishwasher, but just do the air-dry cycle. They come out of the dishwasher a bit drippy, so we put them in this tray to finish drying, before storing in a drawer. For leaky-drippy jugs, I placed a tin pan under each. Previously I had laid newspapers on the shelves to catch the drips, but those got yucky fast. I still have a couple of things that need permanent homes, most notably, the scads of plastic grocery bags, and the dehydrator. definitely would like a new shelving unit to replace the white plastic one, The white one is only 12 inches deep. A new 18 inch deep unit, and one shelf taller, would nearly double that part of my storage space. What organizational tools and techniques do you use that keep your pantry working for you? Do you keep your pantry tidy year round? Or do you need to do a major clean-up every so often as I do? Wow, you have a big pantry and store a lot of stuff. For me, I try not to buy too much stuff even when it's on sale because I usually end up wasting some of it. You may do much better at using things than I do. You seem to like the kitchen arts. 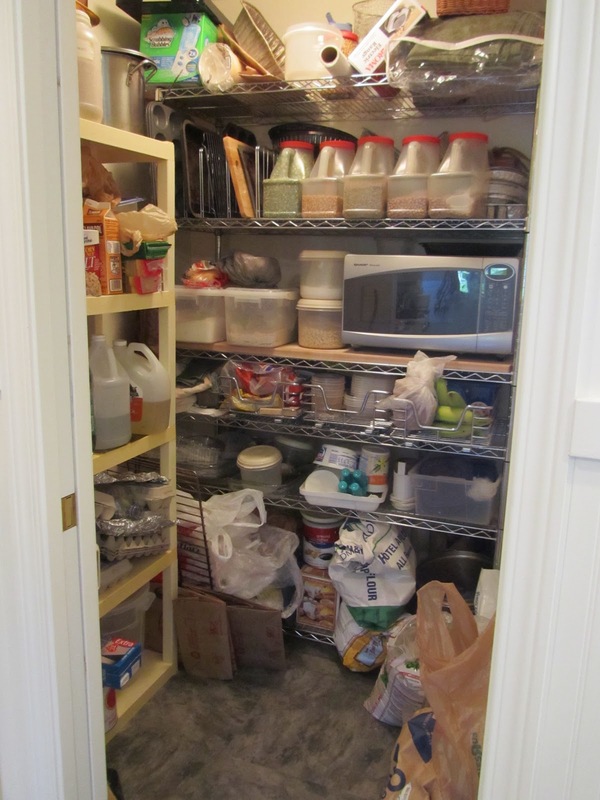 Another thought, if you put a step ladder in your pantry won't you have to drag that around just like the chairs and it will be another thing to move out of the way of things in the pantry? I'm not sure I'm envisioning it all correctly, but that's what popped into my head when I read about the ladder. Our pantry probably looks bugger than it is, but it is still a good size. (I think it's about 5 feet square). We converted an unused corner in the kitchen, family, laundry area to a pantry several years back. Before this pantry we had a freestanding armoire for a pantry. It worked, but it was small. I do buy quite a lot, but as you've observed, I enjoy cooking and baking, *plus* (and a big plus here) I have two teenage daughters who love, love, love to cook. They're making dinner tonight. Yesterday they baked a big batch of cookies. They always have something they want to make. I had in mind a collapsable step ladder that would hang on a wall when not in use. 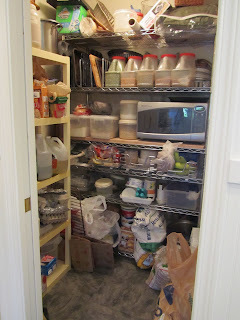 Mostly I need to be able to get to the top shelves in the pantry, easily enough that I don't just toss stuff up there. We'll see. I take my time choosing things, so this could be a while! Hope you feel better now the dentist is out the way. Nice to hear that I'm not the only one who has an unfocussed day now and then. Pantry looks great, those storage pots with handles look really useful. My dentist appt is over. I survived, but it was stressful. Now on to better things. Yeah, I love those storage containers. When my 3 kids were small they had a favorite treat -- fake bacon bits. I used to buy them from the wholesaler in those gallon-size jugs. Can you believe we went through that many jugs of fake bacon? I used to eat them by the handful too. Anyways, the containers are so handy. I've had a couple of people ask where I "bought" them, even. Do you have some favorite storage containers in your pantry? I like containers that I can see through. Some food items just look pretty, when you can see through the containers. Glass jars are nice for that, too. Extremely large Vlasik pickle jars are my storage solution ;) The only downside of them is that they are glass and heavy so I can't let the children use them yet. I love the look of glass jars in a pantry. I'm a bit clumsy and my shelves don't have a lip on the edge. So I reserve my glass jars for the fridge. But I can imagine really large pickle jars would look great with grains and beans in them! I love this post! I like seeing other people's pantries. Yours looks really good after your clean out. I don't keep mine tidy year round, but usually do a major clean out when on holiday from school. 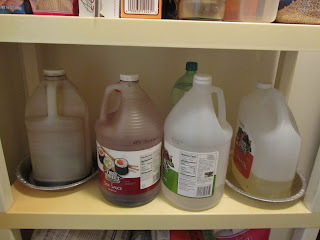 I'm curious, do you mind telling me what kind of food came in the re purposed plastic food storage containers with the handles? Those are really nice and they look great on your pantry shelf. :) You did a great job. The containers with handles had fake bacon bits. My kids used to eat those as a treat when they were young (and I ate them too!) I'd toss them into baked beans, on top of baked potatoes, in soup. Anyways, over the course of about 4 or 5 years we went through enough of those for me to acquire about 6 of those jugs. And I like peeking into other people's pantries too. I was online the other night googling images of pantries. Strange, I know. But I'm always looking for new ideas. hi. your pantry seems really big. need quite a work on regular basis to manage. i suggest use as many labeled containers as you can. I do have to do a major clean-out once or twice a year. But it's not that onerous of a task. I should really label some of the containers, and am currently relying on memory for some things like masa and corn flour, which could easily be mixed up. I'll get on those labels right away.